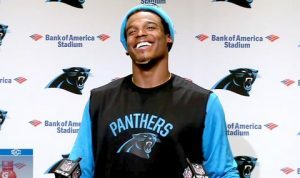 Cam Newton the star quarterback for the Carolina Panthers laughed at a female reporter who had asked about one of Newton’s teammates saying it had been funny to hear a woman ask the question. Jourdan Rodrigue a beat reporter for the Charlotte Observer asked the Panthers quarterback during a news conference on Wednesday about Devin Fuchess embracing how physical the pass routes were and if Newton enjoyed that. Newton responded by saying that it was funny hearing a female speak about routes. Steven Drummond the director of communications for the Panthers said that he has spoken to Newton as well as Rodrigue and he says the two had spoken and Newton regretted using the words. However, Rodrigue said through a statement that the Panthers quarterback had not apologized. In her statement, she said she did her job as a beat writer and asked Newton a question about a receiver on the team. His response dismayed her, which did not just belittle her but countless more women prior to her and beside her working in jobs that are similar. She added that she sought out Newton a few minutes after when he left the team’s locker room, but he did not apologize for what he had said. A report from the Charlotte Observer said that Rodrigue asked Newton after if he thought a woman could not understand routes that receivers run. Newton apparently told her that she did not see routes while watching the game, but just saw if a receiver was open. She argued he did not know what she saw or how much she studied football and maybe the two should have more of a conversation. The Observer’s executive sports editor Mike Persinger called the comments made by Newton both unfortunate and out of line. He added that the question that had been asked by Rodrigue was a valid one, like countless others about football nuance and strategy she has asked over the course of her job. The NFL through a prepared statement said the comments were plain wrong as well as disrespectful to the female reporters and all journalists. Newton’s comments were also condemned by the Pro Football Writers of America saying that he had crossed the line. Earlier in his NFL career, Newton made headlines for interaction he had with the media following Carolina’s loss in Super Bowl 50 to Denver, when he cut short a session he had with reporters.